I'm afraid I more or less buried this news in the previous blog post about the Pay It Forward story on NBC Nightly News. Now I'm reminded that this needs to stand alone. 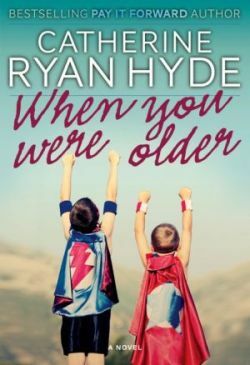 On the day the news story aired, we dropped the price on my novel When You Were Older, thinking it would be a good place for new readers to start. Of course, I'm always happy when my faithful long-time readers get a good deal as well. But I also know that the majority of you will have read it. (I'm working on two new novels as fast as I can!) In that case, I hope you'll pass the word along to your reader friends. This deal will be in place through Thanksgiving weekend, to give everybody plenty of time to take me up on it. Please do tell anyone you know who might be interested, and if you're just now reading it yourself, email and let me know what you think. For those who don't know it already, my real email address is on the Contact Me page. I should probably also repeat the following for those who are new here: you don't need a Kindle to enjoy a Kindle ebook. You can download free Kindle Reading Apps HERE for your computer, tablet or smartphone. And if you have a Nook, or other non-Kindle ereader, there are instructions for converting a Kindle ebook HERE.